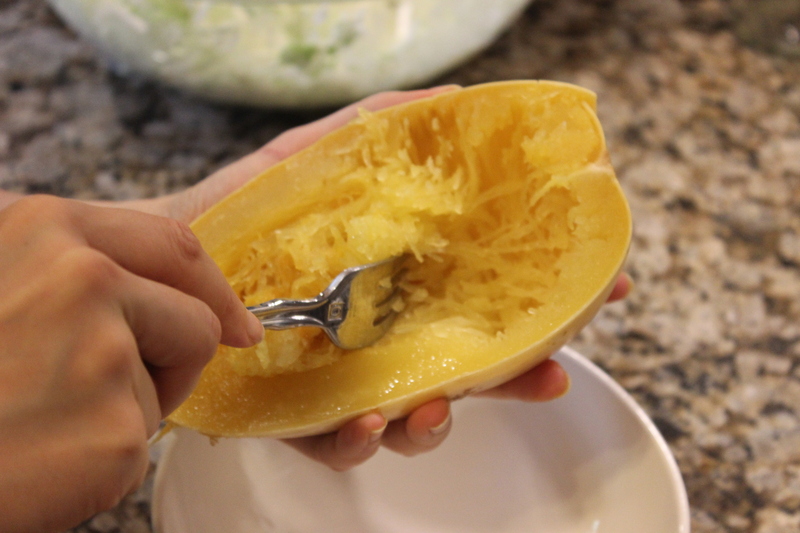 Spaghetti squash is one of those foods that a lot of us have heard about or seen at the grocery store or farmer’s market…but perhaps been a bit too intimidated or weirded out to try. I’ve got good news for you! 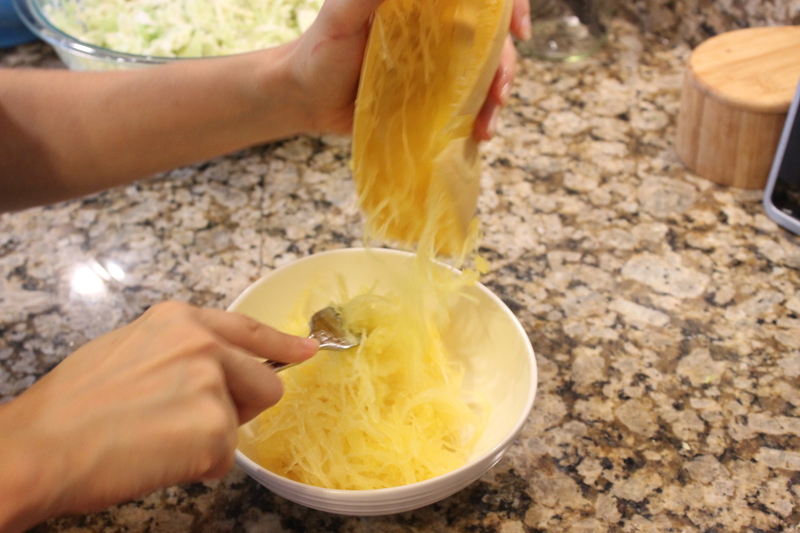 Spaghetti squash is very easy to cook AND fun to play with 🙂 I’m always up for anything that makes cooking more fun, and this ingredient definitely does! You can upgrade your pasta by swapping it out for spaghetti squash. 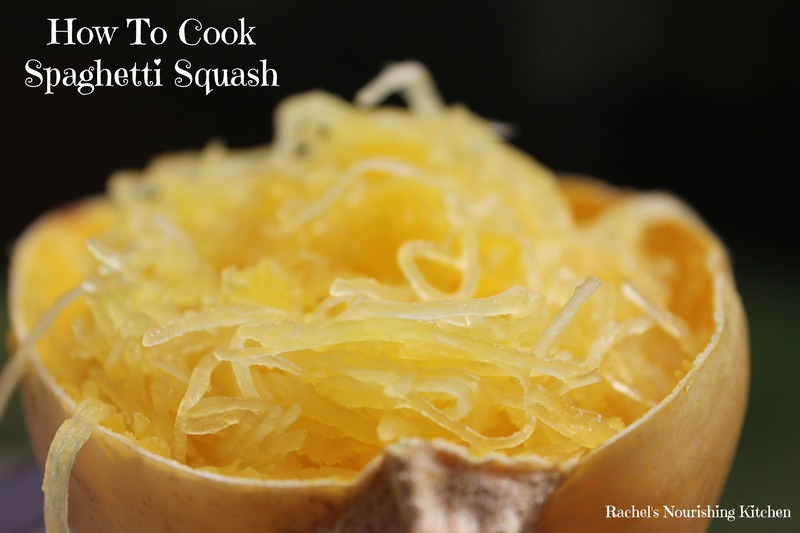 As its name implies, the inside of the squash can be scraped out to form spaghetti-like strands, so you can serve it just like you would spaghetti. Top it with your favorite marinara or pesto sauce or sauté it with garlic, onions, spinach and some herbs. It’s tender but has a slight “crunch” to it. It’s rich in fiber as well as beta-carotene, which is good for our vision, immune system, and healthy skin. 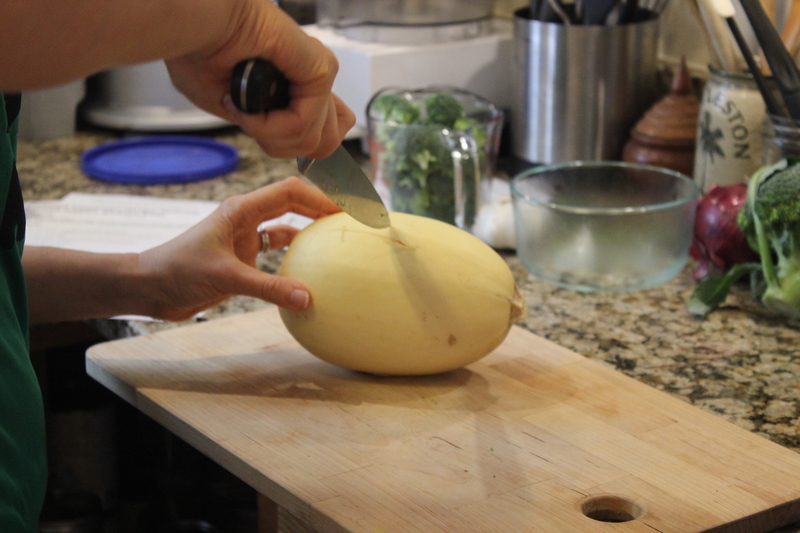 I’ll be sharing a recipe for a Tuscan spaghetti squash boat later this week, but in the meantime, here’s how you make spaghetti squash! Preheat oven to 400F while you prep the squash. 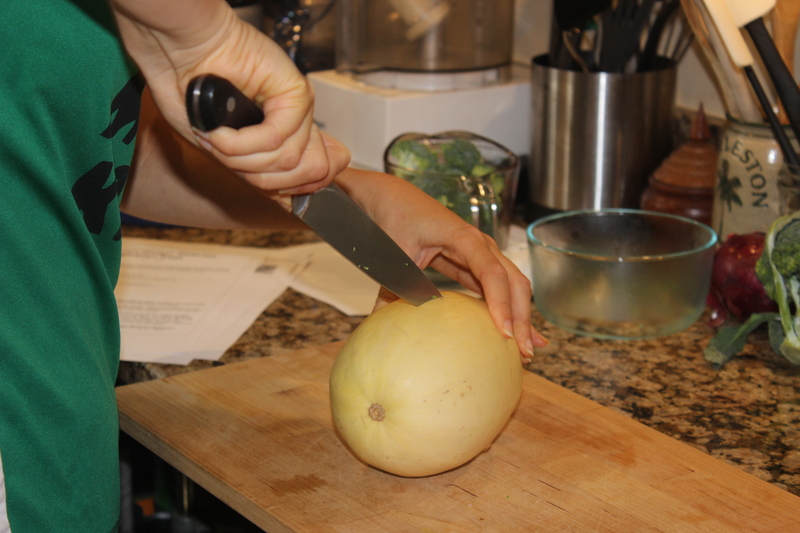 Slice a line down the length of the spaghetti squash, about a half inch deep, but don’t cut it in half. It’s usually too hard to cut in half at this point, unless you have a really good knife. Turn the squash the other way and cut about 4 strokes into the squash, cross hatching the longer line you already cut. 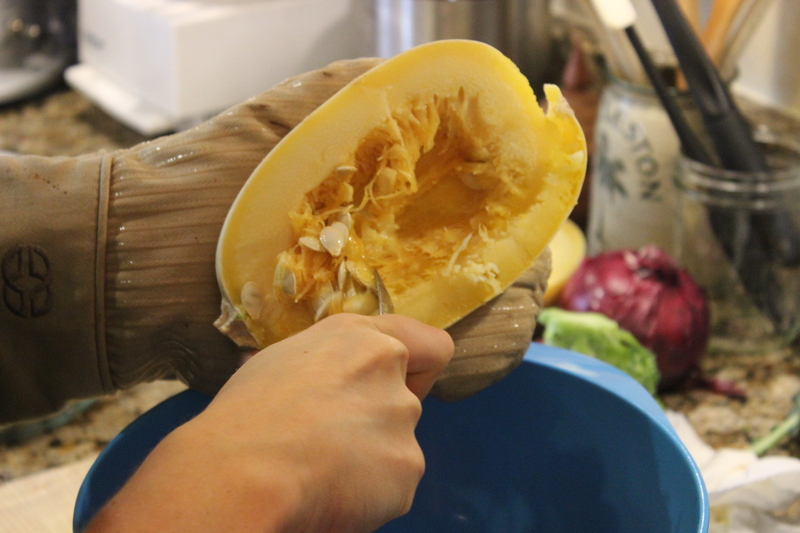 Cutting the squash this way allows it to steam in the oven and prevents it from exploding 🙂 Put the squash in a baking dish in the oven for 20 minutes, so it can soften enough to cut it in half. Remove squash from the oven and cut it in half. It should cut easily at this point. 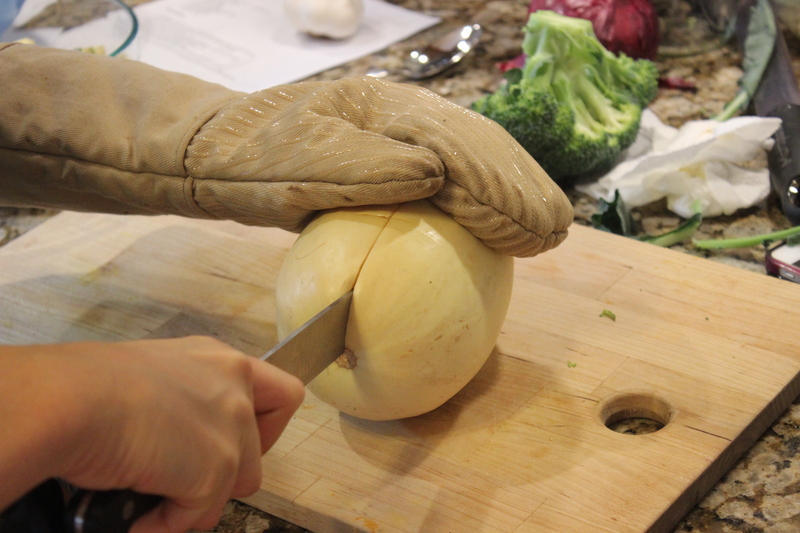 Wearing an oven mitt (the squash will be HOT), pry it open with your hands. 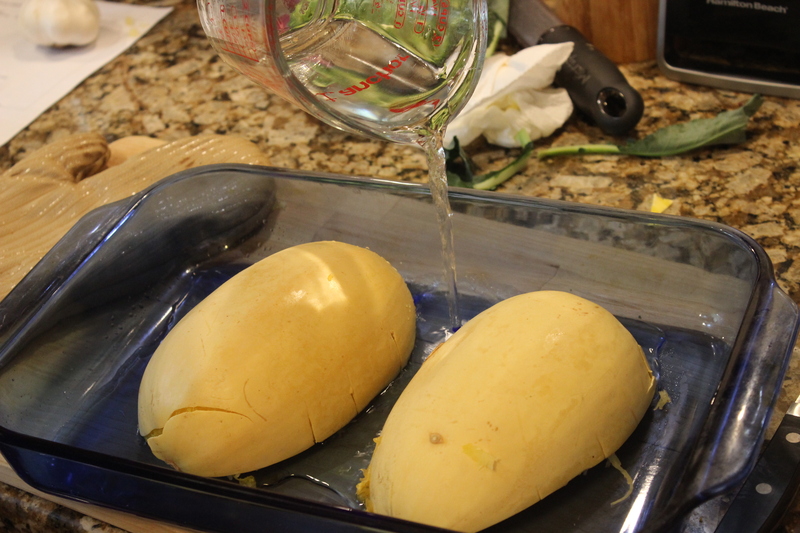 Put the squash cut-side down in a 9×13 baking dish and fill the bottom of the dish with about 1/4-1/2 cup of water (enough to cover the bottom of the pan). 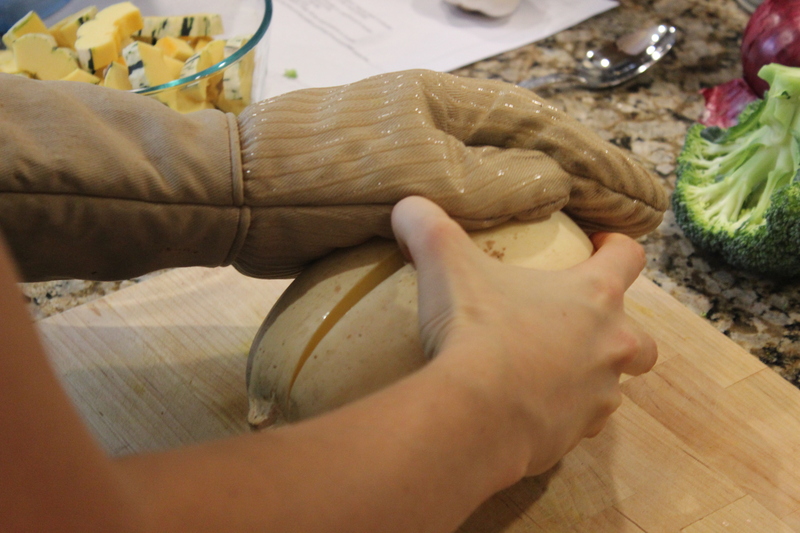 Return squash to oven for 30-40 minutes or until the squash easily pulls away from the shell. 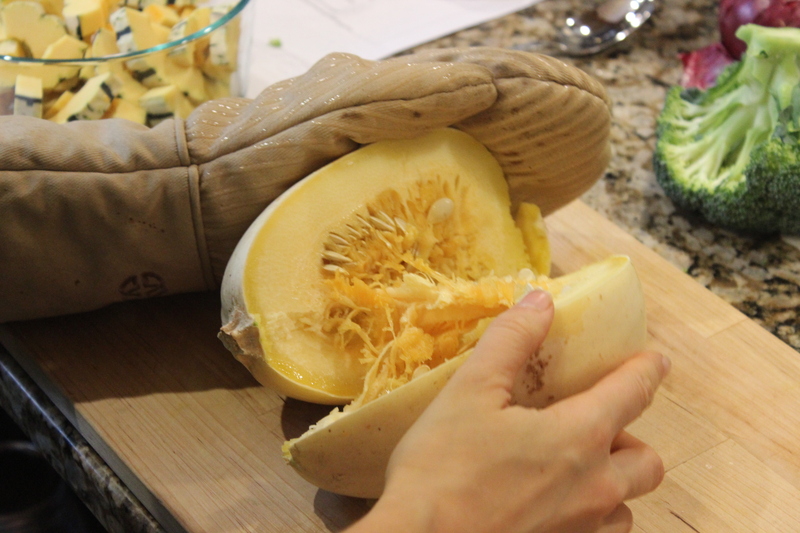 Let the squash cool and then scrape out the inside with a fork. It should pull away easily into spaghetti-like strands! 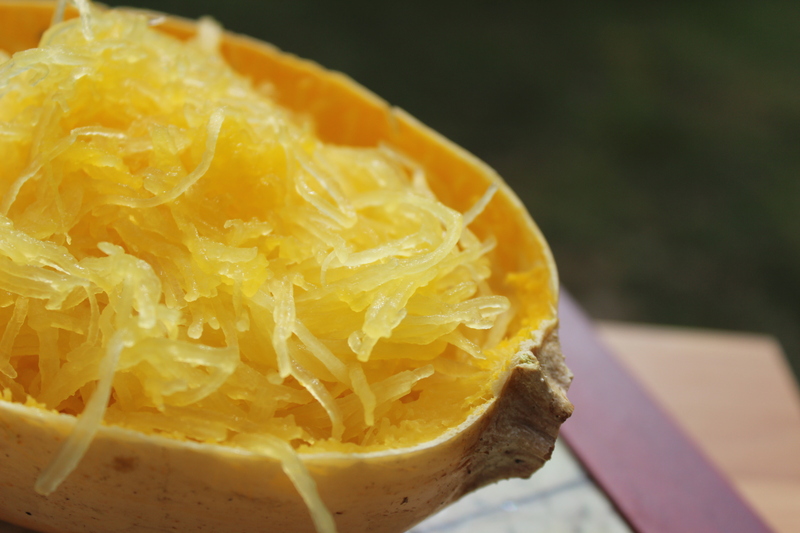 Beautiful spaghetti squash ready to be used for your delicious kitchen creations! I’ve done thus method and prefer the texture when done this way. However, when I’m in a hurry I cut the squash lengthwise and place one side at a time in the microwave (pulp side up, skin side down) for 5 mins. Perfect!